One of the biggest downsides to BYOD policies when it comes to computers and laptops is the difficulty managing it from an IT standpoint. In most BYOD settings, employees are using their existing laptops, which are typically laptops meant for home use—meaning they have home version of the operating system if they’re on a Windows machine. You have two options here, both of which are going to cost you: pay for an upgrade to a business version of Windows (Windows Pro or Enterprise) or run into serious issues with device management and hidden costs. Home versions of Windows cannot be correctly joined to the tools used to manage computers from an IT standpoint (Windows Active Directory or Azure Active Directory Domains). This lack of centralized management means your IT team will have to do a lot more manually (for example, they can’t push out new versions of software to everyone at once—they’ll have to do it individually). At best, this will be annoying. At worst, it’s going to be a time and cost sink. Managing BYOD machines from a security standpoint gets much harder when the computer cannot be joined to a device management platform like Azure Active Directory. Things like mobile device management remotely wiping company data from a device aren’t possible. If a computer is lost or stolen, or an employee leaves, there isn’t much you can do if they have company data on the computer. BYOD machines can also run into compatibility issues with line of business applications or other critical systems. Line of business applications typically have specific technical requirements—like operating systems built for business, not personal, use. Users with older machines, even if they are running something like Windows Pro, may run into compatibility issues, too. All of these complexities with managing BYOD devices, along with a lack of standardization, add up to major hidden costs most companies don’t consider. The hidden costs can include everything from licenses upgrades, to additional IT management costs, to dealing with a data leak from an unsecured stolen laptop. 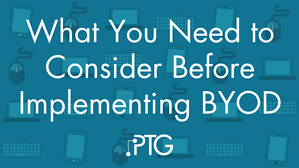 Since there isn’t a standard BYOD set up, these costs can be unpredictable and hard to manage. This doesn’t mean that BYOD isn’t the right choice for your company. If most of all of your systems are in the Cloud, these factors may not be a huge hurdle for you. But they do need to be considered before you implement BYOD and any time you’re talking about IT budgets.